Shannon Galvin, MD, assistant professor of Medicine in the Division of Infectious Diseases; Chad Achenbach, ’02 MD, ’02 MPH, associate professor of Medicine in the Division of Infectious Diseases and of Preventive Medicine; Gregory Phillips II, PhD, MS, assistant professor of Medical Social Sciences and of Preventive Medicine; John Phair, MD, professor emeritus of Medicine in the Division of Infectious Diseases and Claudia Hawkins, MD, ’06 GME, associate professor of Medicine in the Division of Infectious Diseases, share their experiences in treating HIV during a presentation commemorating World AIDS Day. 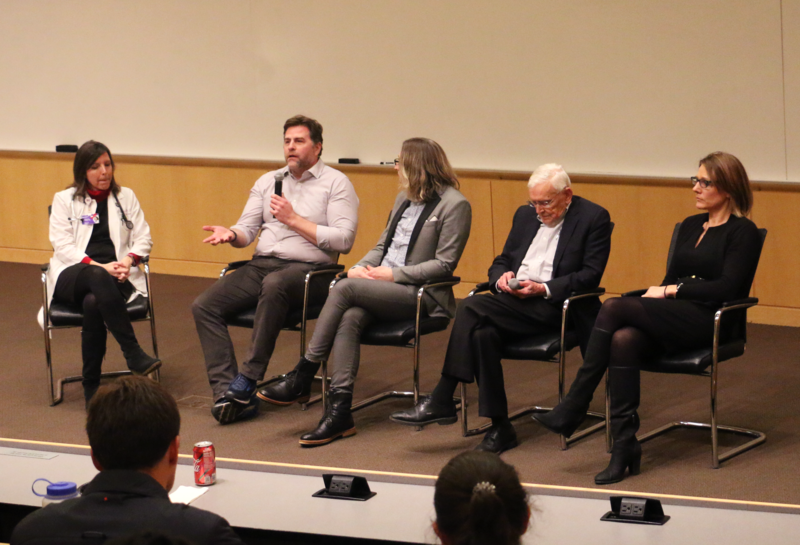 Northwestern faculty who investigate and treat HIV and AIDS gathered to share their experiences during a panel held December 3, to commemorate World AIDS Day. The event was sponsored by the Student Advisory Committee for Global Health, an organization that helps shape global health education at Feinberg. “Students are interested in the initiatives for prevention and eradication that are being implemented in the city of Chicago, but also want to compare and contrast these practices with HIV initiatives across the globe,” said Lia Benes, a second-year student and chair of the committee. Treatment for HIV has greatly improved over the past two decades, including pre-exposure prophylaxis (PrEP), but many of the same barriers that dog other chronic diseases, such as access and cost, still affect HIV treatment today, according to Claudia Hawkins, MD, ’06 GME, associate professor of Medicine in the Division of Infectious Diseases and a member of the panel. Further, the stigma of HIV can prevent individuals from seeking or receiving treatment, especially in countries outside the United States, said Gregory Phillips II, PhD, MS, assistant professor of Medical Social Sciences and a member of the panel. Northwestern Medicine faculty answer questions from students about the challenges of treating and preventing human immunodeficiency virus. Novel therapies and strategies to reach the right patients will be key in eradicating the disease, said Chad Achenbach, ’02 MD, ’02 MPH, associate professor of Medicine in the Division of Infectious Diseases and a member of the panel, and recent advances in inhibitor therapies have successfully reduced the prevalence of drug-resistant HIV. While new and improved drugs are obviously important, according to the experts at the event, the public health initiatives used to disseminate them are equally as influential, and both arenas provide an opportunity for current students to one day make their mark. 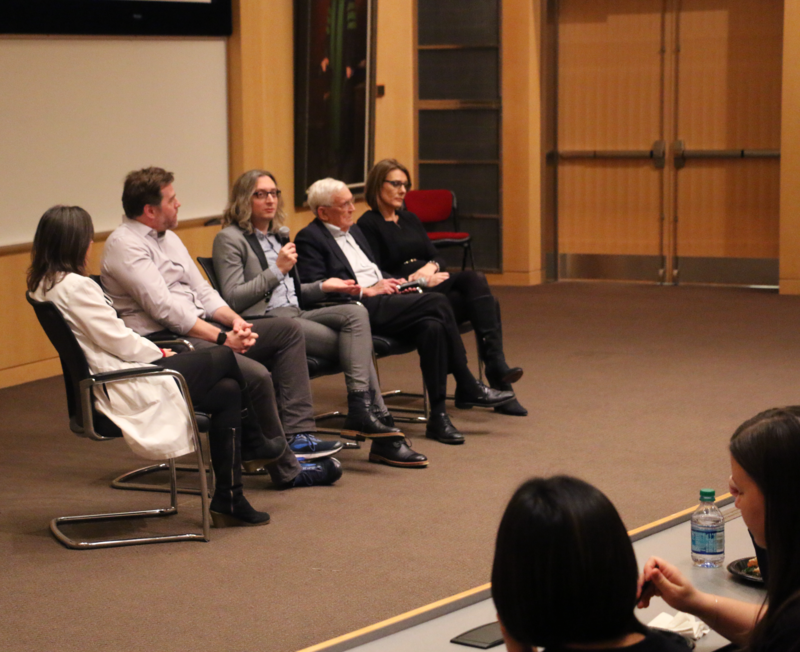 Shannon Galvin, MD, associate professor of Medicine in the Division of Infectious Diseases, moderated the panel, and John Phair, MD, professor emeritus of Medicine in the Division of Infectious Diseases, was also a member of the panel.